There is no bull market like a uranium bull market. Compare the bull markets of gold and uranium from 2003 to 2008: while the price of gold doubled, the spot price of uranium increased remarkably from $10/lb. to $136/lb. During this period, money was made in gold stocks, but even more money was made in uranium stocks. Uranium equities went parabolic and some went up hundreds of times. Analysts are forecasting that the current uranium bear market is about to end. Now is the time to discover quality uranium investments before this inevitable bull market takes off. Collin Kettell is a private investor with a highly successful investment background in the mining and energy sectors. He comes from a family with deep ties to mining and many past successes including co-founding AuEx Ventures, the company responsible for discovering the Long Canyon deposit, which was ultimately acquired by Newmont Mining for $2.2B. Collin is well connected in the capital markets and boasts an extensive background in project finance & corporate development. Collin co-founded Palisade Global Investments Ltd. in early 2013 with the goal of investing in and backing undervalued junior mining companies. Niko Cacos is the President and CEO of Blue Sky Uranium Corporation. He brings over 25 years of management and advisory expertise in the mineral exploration industry. He has worked with Grosso Group since inception and serves as senior level executive for all the member companies. 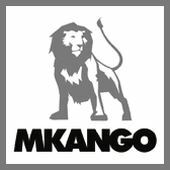 Niko’s career includes administration and strategic planning for public companies. He currently serves as an officer and director of a number of TSX Venture Exchange listed companies. He holds a Master of International Management degree from Heidelberg, Germany and a Bachelor of Science degree from the University of British Columbia. Guillermo Pensado is the Vice President of Exploration and Development for Blue Sky Uranium Corporation. He is a professional economic geologist with more than two decades of expertise in the mineral exploration industry – with particular emphasis on uranium. He holds extensive experience in exploration and economic project assessment in Argentina, Brazil, Chile, Peru, USA and Canada, mainly focused in uranium, precious metals and copper deposits. In the last decade, Guillermo has worked in the start-up of new projects and companies, and has held positions from advisor to V.P. Exploration. 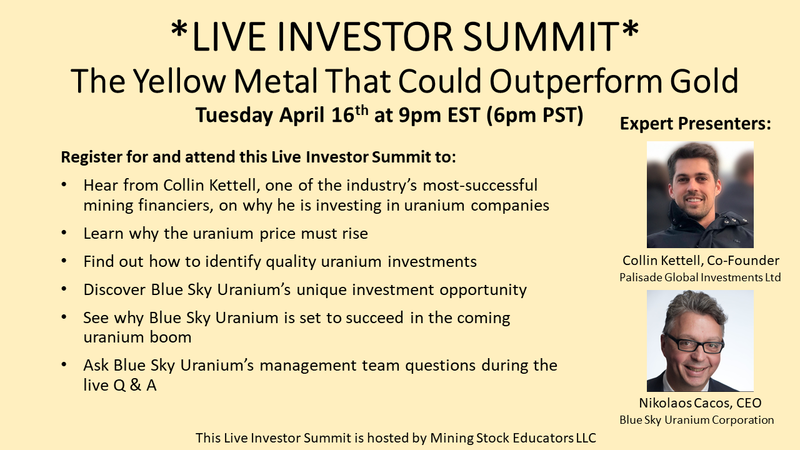 This Live Investor Summit is hosted by Mining Stock Educators LLC, which exists to educate the resource investor regarding quality mining investment opportunities.